Sunset in Santa Lucia can be an amazing experience! Naples is the main reason why I decided not to become a full-time digital nomad. The busy streets, the magnificent historical buildings, the scent of pizza and ragù in our narrow vicoli and the amazing Castel dell’Ovo, our castle on the sea. 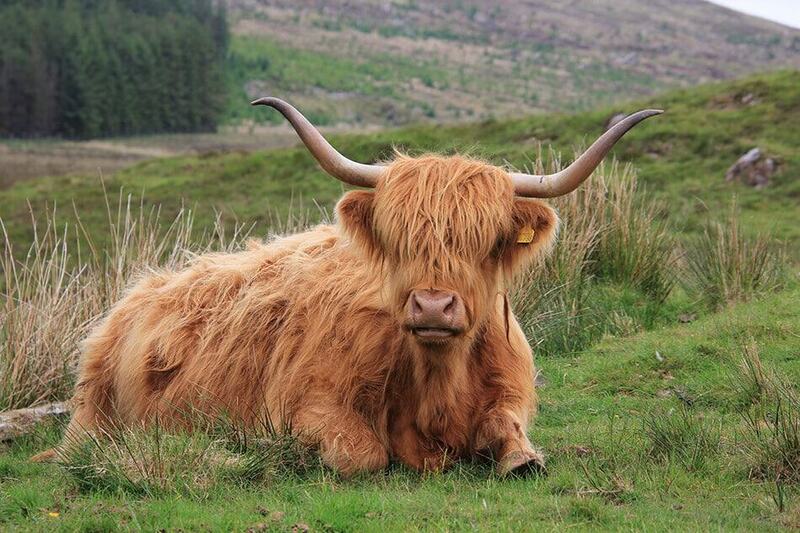 There’s no way I could part with such beauty. Sure, I do betray my Napoli now and then, but I’ll always get back home after a while. And I love to write about why it’s one of the places you should add to your Italy bucket list! The main concern of many worried travelers is what is the best area to stay in Naples. 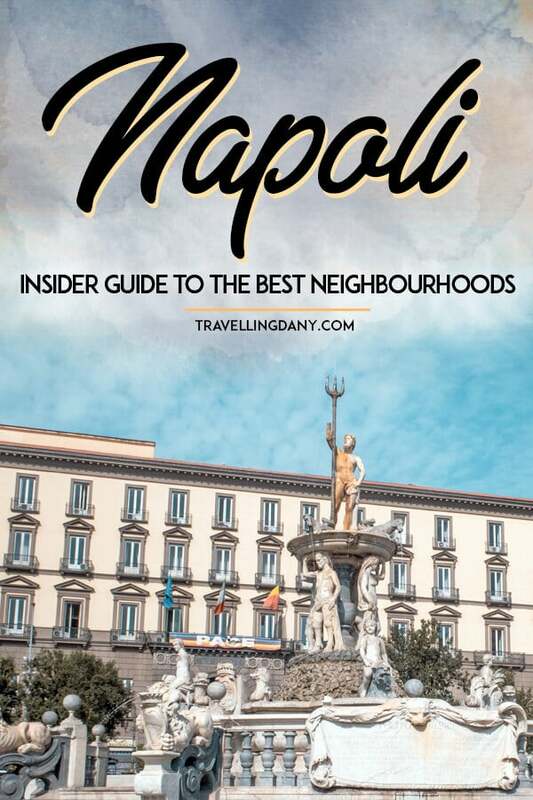 As you know, some people still think that Naples is dangerous, so I decided to write a neighbourhood guide for those who want to visit and are wondering where to stay in Naples. Let me show you my favorite areas that will allow you to explore the city, so you’ll be ready for when you visit Naples! 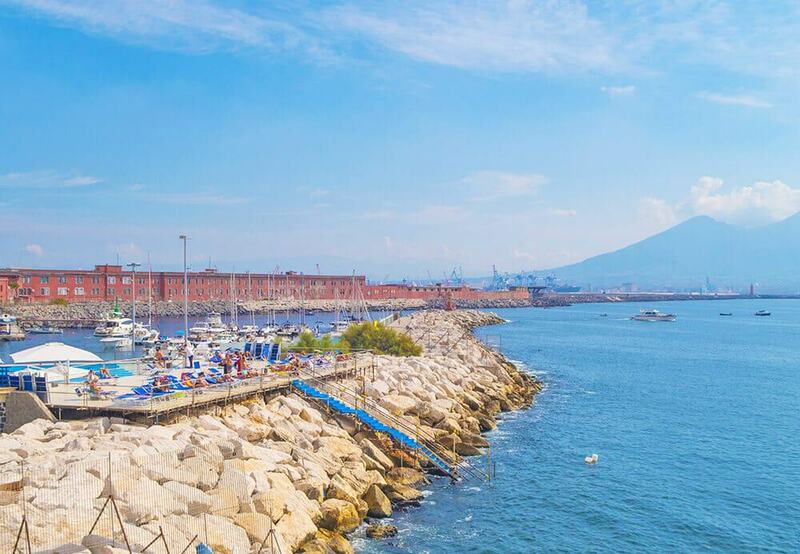 Also known as “Santa Lucia” this is the place where you’ll find the best luxury hotels in Naples with an amazing view. If you’ve already read my article on the most romantic spots in Italy where you can spend Valentine’s day, you’ll already know about Borgo Marinari. This tiny area is located on the island Megaris. It is basically the very little island on which our “Egg castle“, Castel dell’Ovo, was built. Some say it looks similar to a few of the villages on the Amalfi Coast! You can reach the island from Santa Lucia, it’s just a short walk away… but this stone bridge is also one of the most romantic spots in Naples, where so many couples come to swear eternal love to each other. Borgo Marinari was an ancient little port used by the fishermen. Nowadays it’s where you can find amazing restaurants for romantic candlelit dinners, and where you can walk hand in hand with your significant other, breathing in the scent of the sea. Are you planning to visit Naples? 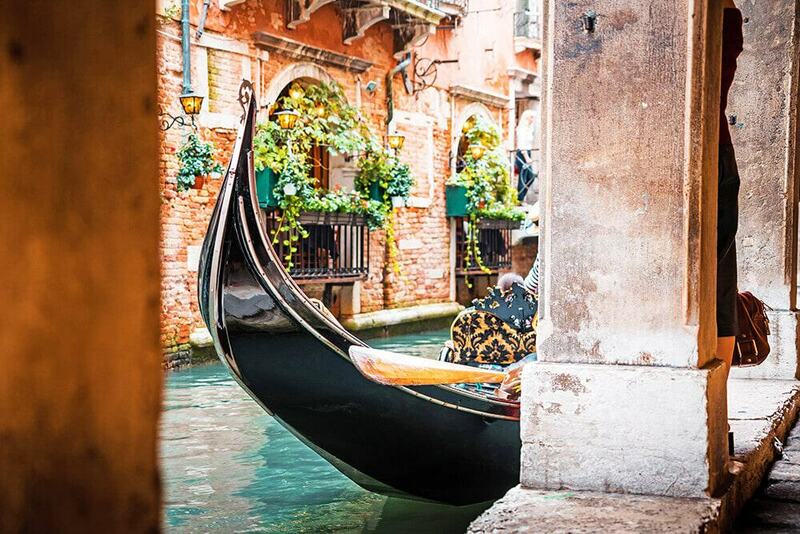 Read what you should pack for your summer trip to Italy! 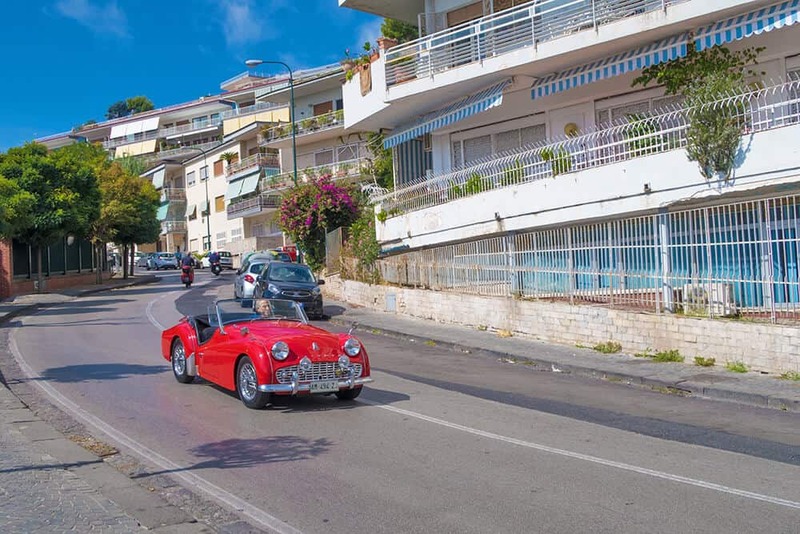 Megaris is so tiny that there is no place for a hotel, and unless you have your own boat, the next best thing is to find accommodation in Naples at Santa Lucia. On the other side of the street there’s the “Grandi Alberghi” (big hotels) area. From those imposing, historical hotels you will be able to see Megaris, Castel dell’Ovo and Borgo Marinari. There are a few reasons why sleeping in this area is so expensive. Three amazing buildings sit right in front of Megaris: Hotel Excelsior, Grand Hotel Vesuvio and Hotel Royal Continental di Napoli. They are just about some of the best hotels in Naples. We make sure to always come here during the Christmas festivities because they put up the classiest, most beautiful Christmas decorations ever. Every tiny balcony has a small Christmas tree or poinsettias: when the Grandi Alberghi start decorating, it’s Christmas for real! Santa Lucia is served by a lot of buses, with several stops very close to the big hotels. You just have to cross the street to get to the sea, and get a nice tan. There are many restaurants, clubs and cafes that you go to just by walking around. And with a 10 minutes walk, you’ll be in Piazza del Plebiscito. The closest Metro is the art metro on Via Toledo, deemed the most beautiful in Europe. Getting there takes about 15 minutes, that you’ll spend doing some nice Napoli sightseeing, or maybe having a caffè espresso (espresso coffee) while admiring the Royal Palace. Grand Hotel Vesuvio in Santa Lucia puts up amazing decorations for the Christmas festivities! As I already mentioned, the big, luxury hotels in Naples that we call “Grandi Alberghi” are three, all located next to each other. The prices are (more or less) the same: what you’d expect from a boutique hotel with such an amazing view, and in a convenient location. Here in Naples it’s not uncommon to book a room at one of these three hotels for the New Years eve or during the festivities, especially if you want to surprise your better half. It’s because it really is the best area to stay in Naples, that offers views, romance and… delicious dinner options. People have to book months in advance to be able to attend their New Years eve dinner at one of the Grandi alberghi! The Grand Hotel Vesuvio was built in 1882 and the design inside is very classical: it feels like staying in an ancient, luxurious Neapolitan villa. Name a celebrity or a politician, and it’s likely that they’ve been at the Grand Hotel Vesuvio. On their website they have a huge (and unfinished) list of the famous people who have been lodging here! 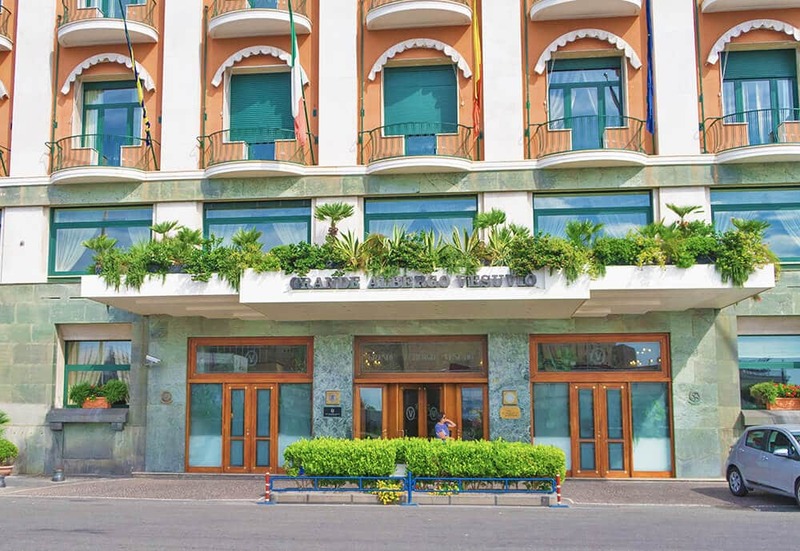 The Eurostars Hotel Excelsior is located in the corner building at Santa Lucia, and was built in 1908. Just like its neighbours, the rooms are pretty luxurious and the decor is Art Nouveau. 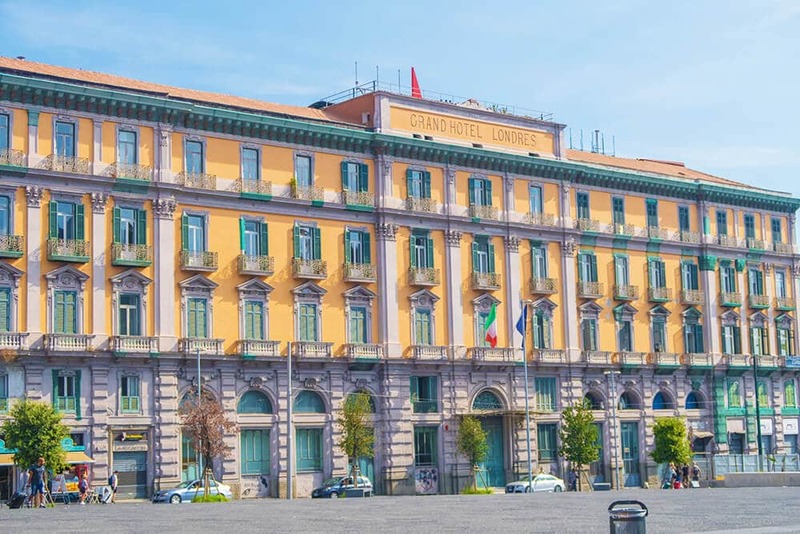 Last but not least, the Royal Continental Napoli, a four stars hotel that offers a more modern design, often chosen by the newlyweds for their first wedding night. They often offer very interesting packages with free wifi, and in the evening they have gourmet dinners at about 33€ per person (which include free parking if you’re renting a car). 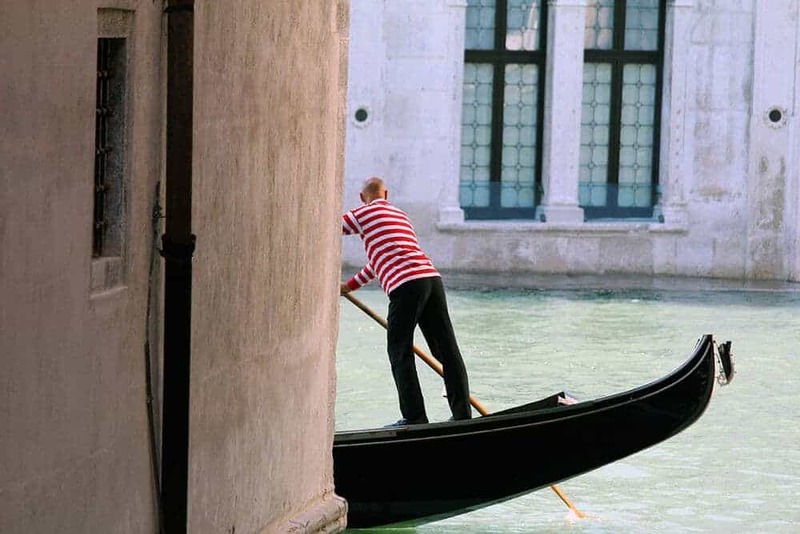 Here you can find a useful guide to tips in Italy to make sure you don’t come across as rude! By booking here, you will also help the Fondazione Guanella-Fernandes, an organization that helps orphans and kids in Naples who live in difficult areas, so they will be able to build a better future for themselves. Chiaia is a seafront neighbourhood in Naples, which isn’t really too far away from Santa Lucia. On the West it’s flanked by another very beautiful area, Mergellina, where there are less lodging options but still many interesting things to see. The most useful station in Chiaia is Piazza Amedeo (that you can use to go straight to Mergellina station, so you won’t have to walk there), and what makes this one of the best places to stay in Naples is the fact that there’s plenty of public transport options. Buses stop everywhere, and while the traffic might slow you down, believe my word: it’s still better than driving! Chiaia is one of the busiest places when it comes to Naples nightlife. Behind the Villa Comunale (our urban park), in fact, there are so many narrow vicoli full of tiny (some can host just up to 10 people or less) restaurants. 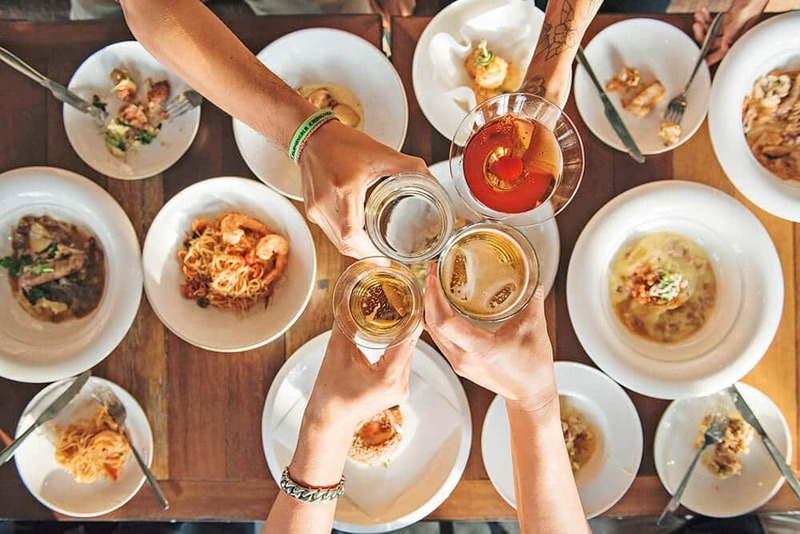 You will find basically every cuisine in the world, from sushi to Spanish tapas, from Mexican dining to Greek gyros. It’s the one area in Naples where you go to if you want ethnic food. Next to these narrow vicoli there’s Piazza San Pasquale a Chiaia, with a beautiful church that has the same name. This square has also more nice cafes and snack bars where the young crowd gathers, not only from Naples but from all the nearby cities. We always go there if we want a nice, warm brioche, or even one of my favorite treats. Skewers with tiny, warm croissants! Each one of them has a different filling (nutella, white nutella etc) and they are delicious! A beautiful old Porche on the Positano Hill: vintage cars are still a big thing in the South of Italy! During the day, unless you’re busy exploring other parts of Naples, you can walk into the Villa Comunale (free entrance) to relax on one of the wooden benches or take pictures of the Cassa Armonica (bandstand) and the 18th century statues inside (instagrammable spot alert!). You’re just a few steps away from Lungomare Caracciolo, where you can lay down to get a nice tan or enjoy a delicious Italian gelato. There are many seafront restaurants and cafes. 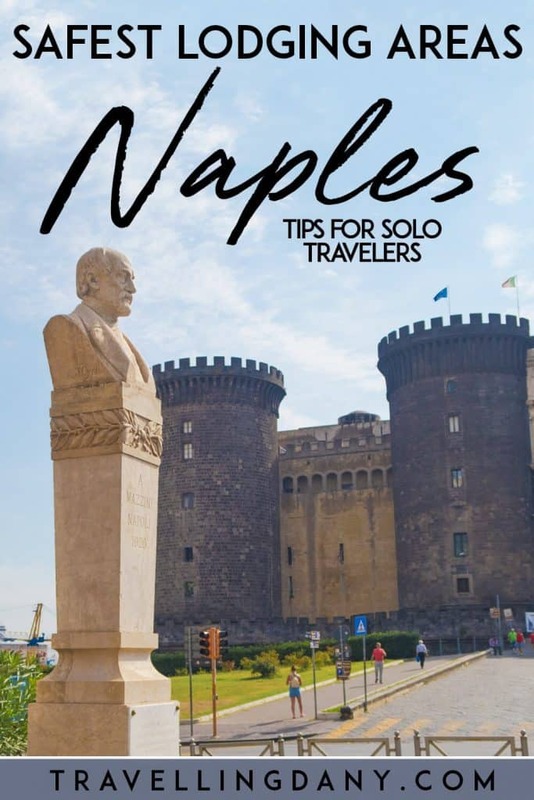 I wanted to list Chiaia as another best area to stay in Naples because there’s so much to do, but if you are driving a car, it might not work for you, unless you pick a place which has a private parking. In fact parking here is an absolute nightmare, it’s difficult even for the locals because of the narrow streets, so take it into account! There a few accommodations in Naples Chiaia that might be interesting if you want to lodge in the area. One is B&B Palazzo Mirelli, located in a majestic historical building that dates back to 1600. Their rooms have free Wifi and a nice view. The only downside I found is that you have to walk for a bit to get to a bus station and if you’re carrying heavy luggage with you, it might not be optimal. 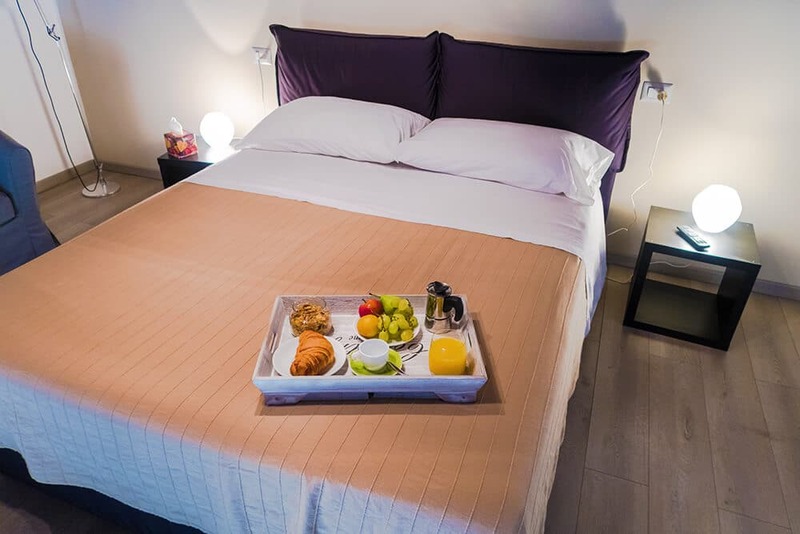 Residenza Carlo III di Borbone is yet another one of the best places to stay in Naples if you are on a budget. Half hotel and half b&b, this place is unbelievably cool, as the rooms are very colorful and they offer free Wi-Fi and. Usually they include a good Italian breakfast in the room price. It’s very close to Lungomare Caracciolo, on the way to Mergellina. The downside is that you will have to walk a bit to get to the bus stop. Last but not least, The Royals Experience is located at walking distance from Piazza San Pasquale, so you are close to a lot of little restaurants and cafes. You also have a bus stop nearby. While on the outside it’s an historical building, inside the decor is super-modern! Fontana del Nettuno with Palazzo San Giacomo at its back: isn’t it amazing? 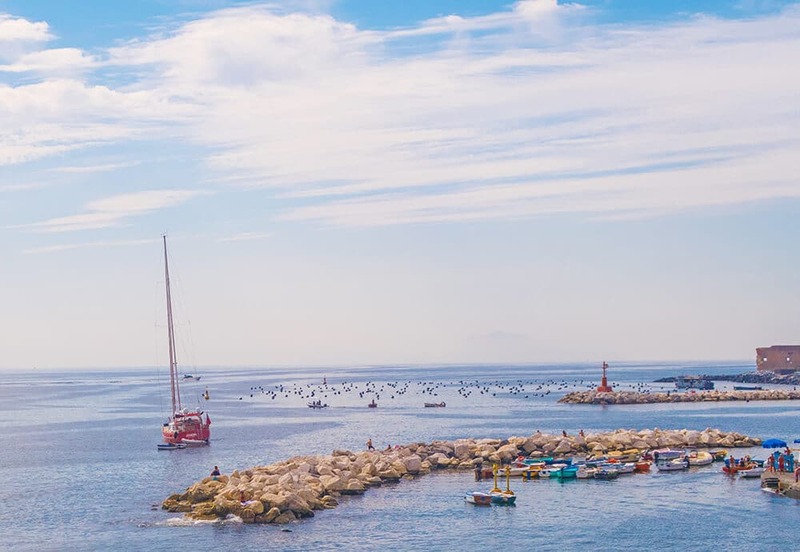 Whether you’re planning to spend just one day in Naples or if you’re thinking of a slightly longer vacation, the best place to stay in Naples is Via Medina. There’s so much to do and see in this area, and besides… the port (Molo Beverello) is a 10 minutes walk from here. You also have 2 of the most beautiful Art Stations of the Naples metro in the area (Toledo and Università), the new “Municipio” station and lots of bus connections to visit the rest of the city. The area around Via Medina has been recently brought back to life (there’s still some roadwork and they are finishing to restore part of Galleria Umberto I, the San Carlo Theatre and the Royal Palace), and it’s absolutely beautiful. On via Medina you will see the magnificent Palazzo San Giacomo (our “Municipio“, so the city hall), that stands before the Maschio Angioino, yet another one of our castles, and at the back of Fontana del Nettuno, a stunning fountain that dates back to 1600. From this fountain you only have to walk for a few minutes to get to Via Toledo, one of the most famous shopping streets in Naples (which gets even more beautiful for Christmas), where you can find the Toledo Art metro and the Quartieri Spagnoli. As I already mentioned in my previous article, in this area you can just walk round to find the best of everything. Piazza del Plebiscito, Galleria Umberto I, 3 theaters (San Carlo, Mercadante and Augusteo), as well as pastry shops, cafes, restaurants and pizzerias. Don’t worry if you see a lot of police cars! 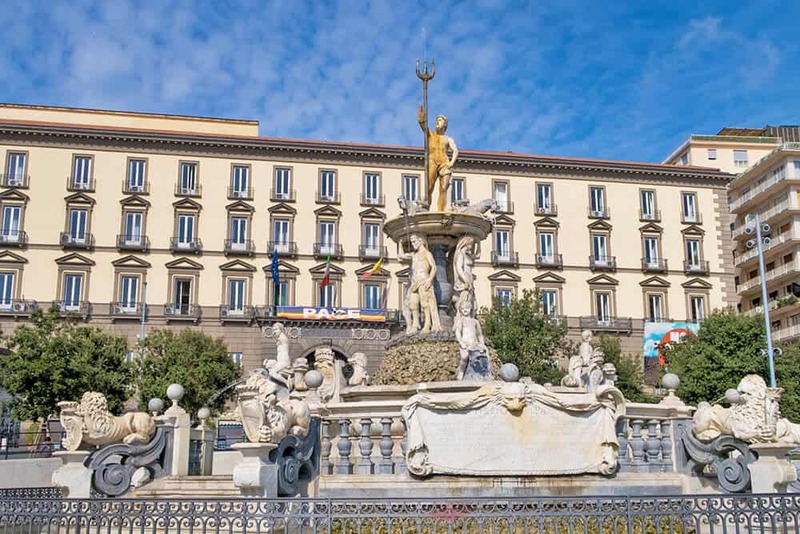 Via Medina is in fact home to Questura di Napoli, the police headquarters in Naples! Too bad that we can’t stay at the Grand Hotel Londres!!! Another interesting fact is that you will see a beautiful building named Grand Hotel Londres. You might be wondering why I didn’t add it to my list of the best places to stay in Naples? Well, because in fact, this isn’t a hotel at all! Built at the end of XIX th century, it was the first Art Nouveau building in Naples. Other architects took after the Grand Hotel Londres to start building liberty style buildings, and lots of important writers, poets and actors lodged here. Today it’s the seat of the regional administrative court. 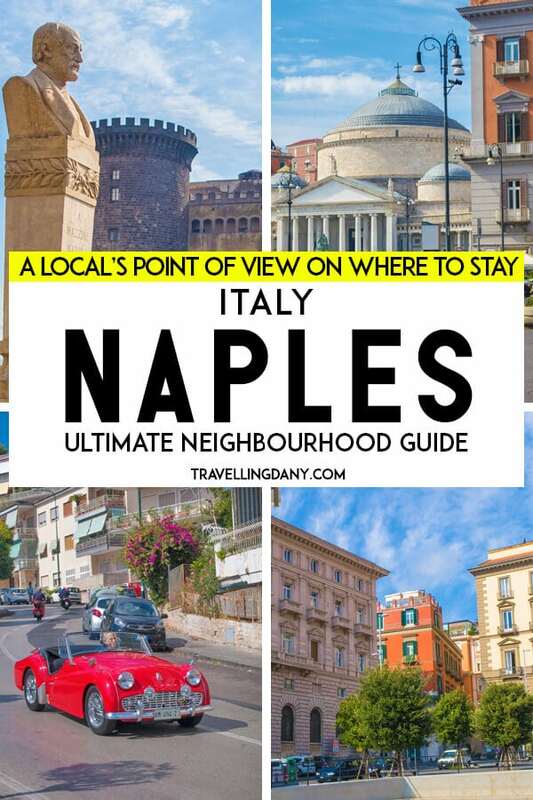 In case you were trying to decide where to stay in Naples (doh! I suppose that’s why you’re here! ), Via Medina could be a good option for the shorter trips. 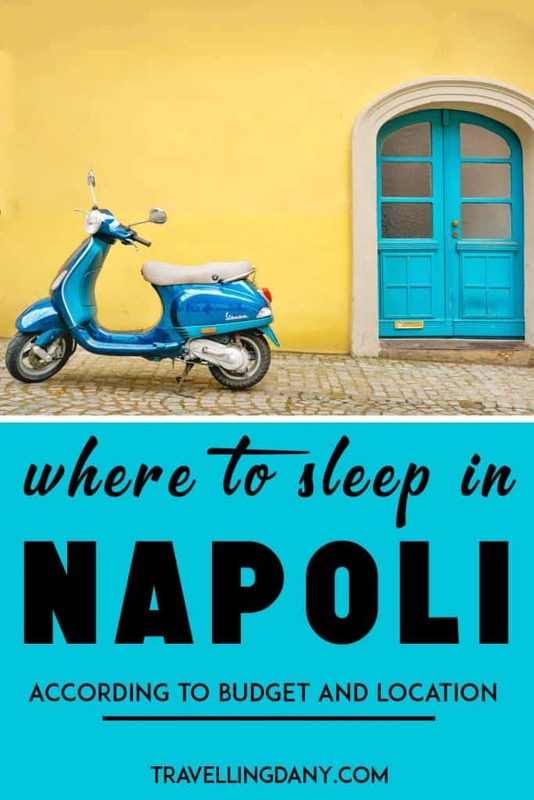 I find it fits in the list as the best area to stay in Naples if you like to walk, or if you’re coming straight off a cruise ship, or if you just have a couple of days. Heck, this area is perfect also for the long layovers in Naples, because you can get your tiny morsel of the city without having to use too much the public transport! One of the best hotels here is Grand Hotel Oriente. It’s located super-close to Via Toledo, less than 100 m from the Toledo Art Metro. The hotel is very beautiful, but a little bit impersonal. It lacks a bit of soul, if you ask me, but it’s still in a great position! The Hotel NH Napoli Ambassador is on Via Medina, at about a five minutes walk from Via Toledo (where you can buy awesome Italian souvenirs!). It’s another big hotel, with free Wi-Fi and maybe more accessible prices. But the rooms are not that big and I found them to be… standard hotel rooms you’d find in lots of other places in the world. They’re not “Napoli” at all. Another good option, very classy and with a view on the Royal Palace, the Gulf of Naples and Mount Vesuvius is Renaissance Naples Hotel Mediterraneo. It is a luxury hotel. The decor inside every room is definitely more traditional. Some of their rooms remind me of the old Pompeii, as they are using the same colors for their decor: yellow and Pompeian red! If you are going to spend only a few days here and want to make sure to really breathe in the city, then the best area to stay in Naples is definitely the Centro Storico (Old Town). Here you will find so much to see and do, and what’s better is that there’s plenty of cheap hotels in Naples, as well as B&Bs. So we can say it’s a more affordable solution if compared to the areas near the sea. As you might have guessed already, Naples is a city full of history. The oldest part of Naples is the Centro Storico, and it includes the Decumano superiore, Decumano maggiore and Decumano inferiore. In these three areas there are high number of historical buildings where the aristocracy used to live, archaeological sites and ancient Churches. Remember when I told you about Naples Christmas Alley? Well, Via San Gregorio Armeno, which is the narrow street where our artisans create their breathtaking nativity sets, connects the Decumano maggiore and the Decumano inferiore. This is why this area is so amazing: you can mostly walk everywhere, and even the tiniest building probably has history. Yet lodging inside the narrowest vicoli might not be the best option for you, because you wouldn’t be close to the public transport. In case you’re visiting Italy in winter, and especially in November, December and January, the area can be very crowded and noisy, as so many people want to visit San Gregorio Armeno. So you need to be clever and find lodging nearby, but not exactly at Christmas Alley, to avoid the noise and the expensive rates. The best place to stay in Naples Centro Storico, where I send all of my friends from abroad, is Home Salvator Rosa 78. This is a very tiny b&b that has opened about 2 years ago in the heart of Naples. Located in an ancient building (and please, don’t mistake “ancient” with “dirty“: the monumental staircase shows that this building has history, but the municipality doesn’t always want to spend money for restoration works) it has only 4 rooms and is very cheap if you consider the shabby-chic decor… or all the bonuses they offer. Free Wi-Fi, the chance to host families of four at half the price of the most famous hotels, and they also allow you to use kitchen and microwave. Why is it important? Because you can buy a delicious “cuoppo”, a pizza a portafoglio or some other traditional food, warm it up and eat it in your room. If you’re planning to visit the Centro Storico in November, December or January, absolutely find lodging here because it’s the best value for money. Of course espresso is a must! Enjoying one while waiting for our friends to get ready to explore the Centro Storico! I always feel safe in sending people here who ask me where to stay in Napoli, especially if they don’t have a big budget. Not only because in Naples Centro Storico you can still find pizza margherita at a price that goes between 1.50€ and 2.50€, but street food in general is cheap (but very good). There are many local markets where you can buy everything you need at tiny prices, and right outside this building there’s something I find very useful. They recently installed a 24/7 vending machine which sells hygiene products, medicines and baby products. Anything you might need for a light medical emergency is just outside your door. Another added bonus is that at Home Salvator Rosa 78 they will serve you a nice breakfast and you can prepare your own espresso coffee with a Neapolitan coffee maker (ask them, in case you don’t know how to do it: it’s easy and you can buy your own at a nearby shop, to prepare espresso at home!). From this b&b you can just walk to San Gregorio Armeno (yet it’s cheaper than the other B&Bs closer to Christmas Alley, and less crowded), to the Museo Archeologico Nazionale di Napoli, to Piazza Cavour and the very beginning of Via Toledo. If you don’t feel like walking all day long, you can just reach the Museo or Materdei art stations or even use the nearest bus station to explore Naples. 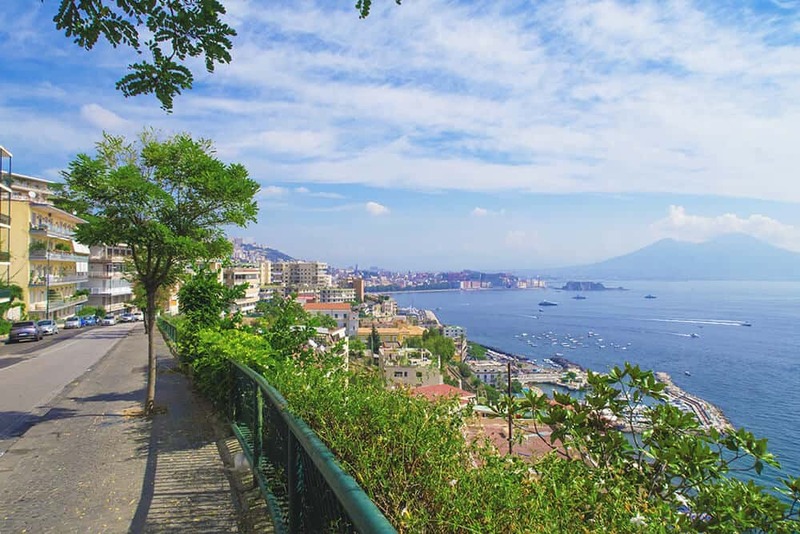 The view of Naples from the Posillipo Hill is like no other! Posillipo Hill is like our version of Malibu (CA). 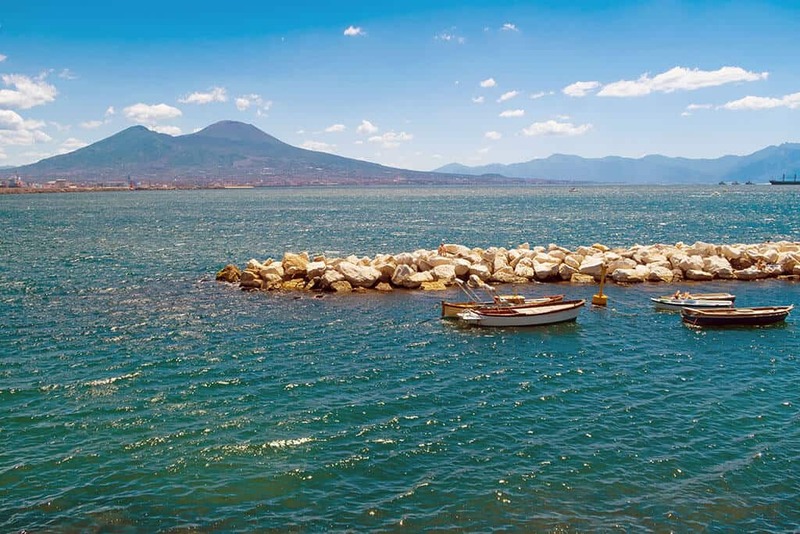 This residential district was annexed to the municipality only in 1925 and has the most beautiful view on the Gulf of Naples. The area started growing as a place for the rich citizens to build beautiful homes away from the crowds, in 1812. Unfortunately, during World War II many historical buildings were damaged, but not all of them! Why I’m sure that Posillipo is one of the very best places to stay in Naples? Well, maybe because here there’s Villa Rosebery, which is one of the 3 official residences of the President of the Italian Republic! A bit like 10 Downing Street, which you’ll be familiar with if you’ve visited London. This breathtaking building is only open to the public for a few days every year and has the very best view on our beloved sea. Posillipo is where so many celebrities, football players, actors and politicians live: here every house can cost billions. Did I already mention that it’s just like Malibu? 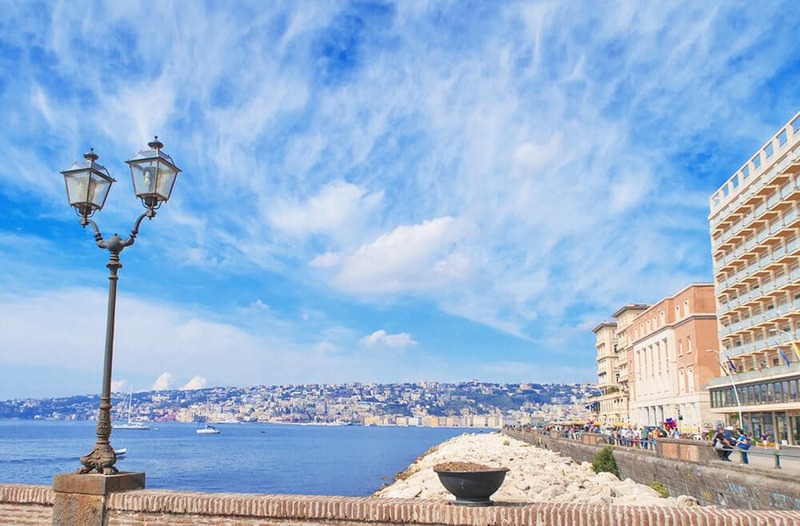 In case you’re planning a spring trip to Italy, know that Posillipo will be gorgeous! The only downside of Posillipo Hill is that you will have to make it do with bus stops and the funicular. 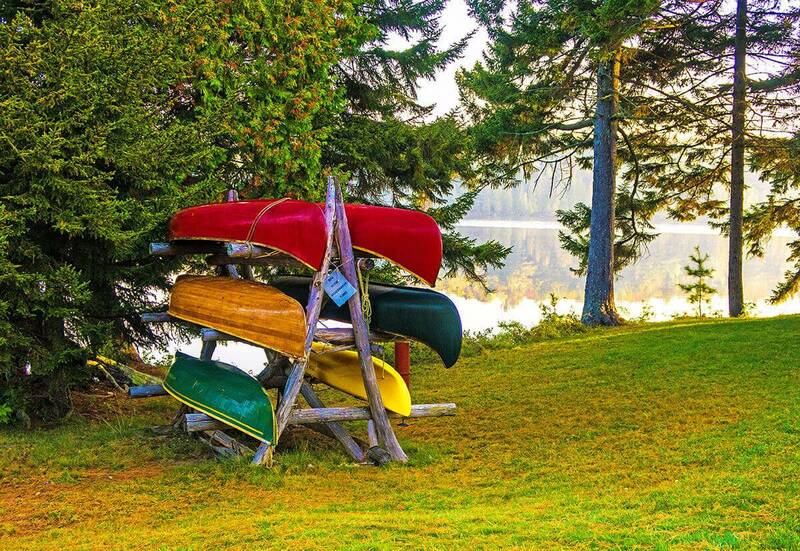 And… that it can be a bit pricey to lodge here. Your best option can be the BW Signature Collection Hotel Paradiso, in a central position, near a few funicular stops, and with an amazing view on the Gulf of Naples. From here, you can use the bus to reach some of the most amazing places out of the beaten path, like the Gaiola Underwater park, the Pausilypon archaeological site, or Marechiaro, a romantic little port where you can also enjoy a candlelit dinner. Your photos are so gorgeous! I love the blue of the sky. Naples is so pretty! I think it’s important to choose where to stay with care, as it makes a huge difference to the quality of your travel experience. Thank you Renuka, I’m so glad you like them! Aldo is working very hard on photography and to be honest… it’s Naples that it’s so beautiful! We also believe that being aware of what to expect is very important. The location of our hotel is the first thing we research when we travel. You’re so right: it really makes the difference! Wow good choice on sticking around versus being a digital nomad Dany. Naples looks fabulous.